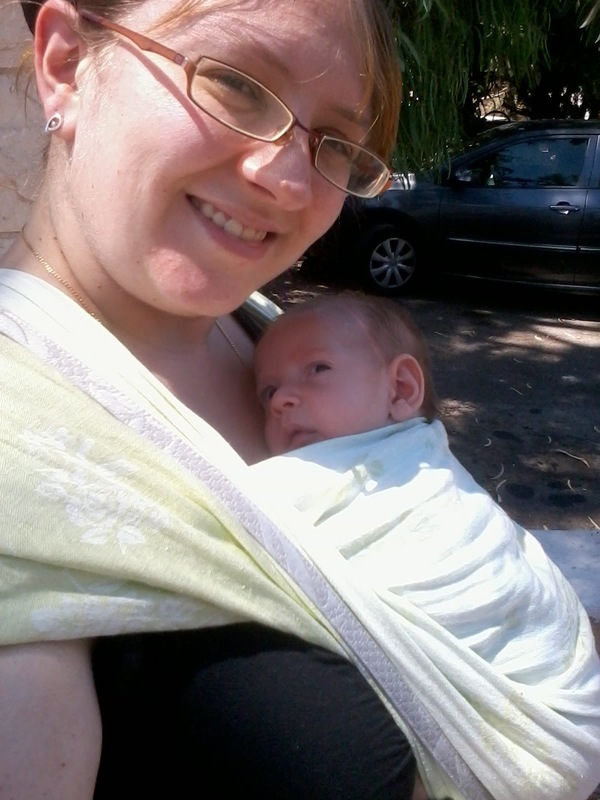 ← Happy Babywearing! Enjoy your Sunday! Who: This is me, Tammy, wearing my then 8 week old son Jesse (now 11 weeks). What: I’m wearing a Heartiness size 5 woven wrap that I bought from a friend I met at a babywearing meetup a couple of weeks before. I had Jesse in a kangaroo carry that I learned at the same meetup and successfully implemented with the help of youtube. Where: On the way to my in-laws’ house in Israel, down the street from our house. Although on a more serious note, babywearing has made life so much easier since Jesse was born. I know that if I can’t get him to calm down at home, I can just pop him in a wrap (I also have a long red scarf that I folded in half and use to do a rebozo carry when I’m just around the house or going down the street now), and go out for a walk, and I know he’ll calm down in minutes.